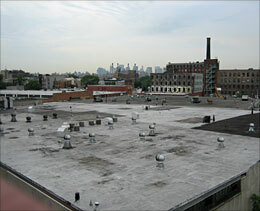 An industrial rooftop on the Brooklyn side of Newtown Creek, from the Pulaski Bridge. New York is so vast that anything you can say of one part is bound to be untrue of another. It is variously hated and loved by people who have and have not lived within its borders. It is based on the size, diversity, and sheer zaniness of the city that I hope an account of my own experience is not redundant. As a sort of tribute to New York, I present some snapshots of my time here during the past few months. In addition to being fun, riding a bicycle is an alternative to the notoriously stress-filled environment of New York's public transit system. Buses and subways can be downright traumatic during rush hours, and I have found the bicycle to be at least as fast for all but the longest trips. But this is not to say that bicycle travel is without its own kind of stress. Having dodged my share of taxis and wide-turning trucks, and after being nearly "doored" countless times, I began to wonder how much of the thrill (that's what you call it on good days) of riding in Manhattan has to do with actual risk and how much is the product of a fast paced and highly charged psychological environment. In other words, is it really as dangerous as it seems when it's happening? To try to answer this question I attached a video camera to my handlebars. As with my litter experiment (below) the results are inconclusive but it was a lot of fun to do. This video is a compilation of the most exciting moments. 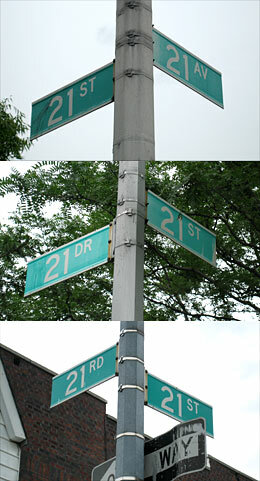 Consecutive signs on 21 Street in Queens. Is it a joke? Is it to ward off tourists? Why do the numbered streets in Queens utilize Road, Street, Avenue, Place, Drive, and Court? The general scheme seems to be that Streets run north-south and Avenues east-west (with the other types sprinkled in between), but there are enough odd angles, skipped numbers and large obstructions to make this rule only slightly helpful. By all appearances, the iPod and the cell phone are rapidly overtaking the newspaper as New Yorkers' primary in-commute diversion. Not just for business commutes, but also weekend excursions and walks in the park. Just how prevalent have they become? As with bicycling (above) I decided to see if my real-time perception (that "most people" use them) matched a more quantitative method of observation, so I sat in the park with pencil and paper and watched. The Peds column lists the total number of qualifying pedestrians and Pct is the percentage that were using either headphones or a cell phone. I recorded the data over 12 non-consecutive hours (stints scheduled randomly) from the middle of the western side of the park. Only people walking alone (or with a dog) were counted. I suspect the percentages would vary widely if broken down by age. Also, it seems like there could be a positive correlation between headphone or cell phone use and walking speed, even among people of the same age. 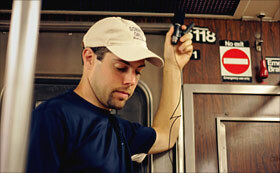 Part of the job of a subway conductor is to announce station names and explain delays and route changes. But some conductors do much more. Especially on weekends riders may hear about what attractions are near the current stop or a brief history of the neighborhood. But my favorite aspect of the announcements is simply the variety of tone and timbre in conductors' voices. As the announcements on the subways become automated (as they are now on most 2, 3, 4, 5, 6, and L trains) we will unfortunately lose this art, and so I have decided to document it for my own (and now your) enjoyment by making recordings. 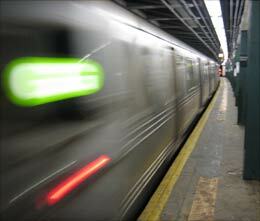 Listen to subway recordings (MP3, 6 MB). Evidence of shipbuilding in the 1800s. The following are some vignettes, windows into Greenpoint's past and present. The well-known 1989 Exxon Valdez oil spill in Alaska dumped 11 million gallons of oil (Exxon's estimate) into the Prince William Sound.2 A spill which is estimated to be over 50% larger, at 17 million gallons, is located in Greenpoint. "Spill" is actually not the most accurate term. Since the 1930s or 40s oil has been leaking from an unknown number of different Greenpoint refineries and storage tanks into Newtown Creek and the soil on the eastern edge of Greenpoint. The seepage was not known to anyone but the oil companies until the Coast Guard discovered it in 1978.3 Efforts since then to clean up the mess have produced negligible results. Above ground at the upper lobe of the oil spill is an area formerly owned by John D. Rockefeller's Standard Oil. There are a few storage tanks left on the east side of Kingsland Ave, but not much else. In fact, the primary feature here today is the lack of vitality. It is unmistakably dead save some tufts of grass and weeds growing up where the pavement has crumbled. Shredded garbage bags caught on razor wire spirals, blown truck tire scraps and crushed Chevy carcasses set the mood in this wasteland. 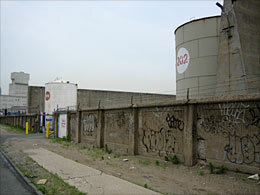 This is the former site of the Mobil Brooklyn Refinery (which began operation in the late 1800s).4 It is currently a BP-owned petroleum storage terminal. 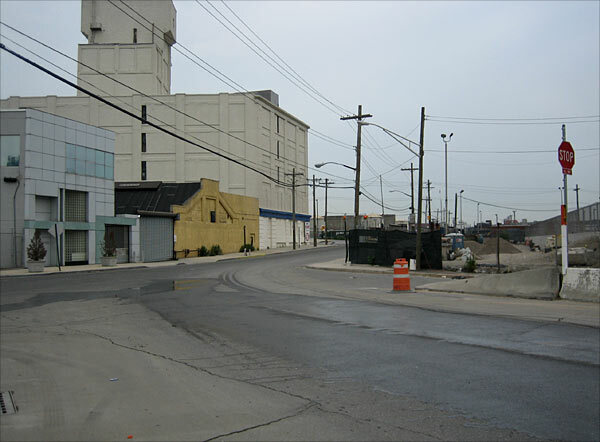 Whether or not this facility (or the old Mobil Brooklyn Refinery) is a culprit in the 17 million gallon leak is yet to be officially determined, but the entrance pictured is located on Norman Avenue at Hausman Street, the center of the plume. The pavement at this intersection erupted in 1950, injuring three people. Imagine this: you're walking around your neighborhood on a weekday, just past noon; maybe you're getting lunch. Suddenly, an explosion demolishes a 10-foot section of the street and sends sewer covers flying dozens of feet into the air for blocks all around you. Hundreds of shop and apartment windows are shattered, and hordes of people run out onto the streets yelling "war!" and "atom bomb!" This is what happened on October 5th, 1950 at the corner of Manhattan Avenue and Huron Street in Greenpoint.5 Amazingly only three people were injured, but perhaps the scariest part is that the police were only able to make a vague guess about the cause: an explosive chemical leaking into the sewers. Several days after the explosion investigators were still searching for such a leak, giving little assurance against a repeat occurrence.6 Recently it has been suggested that the explosive chemical was one of the products leaked from the nearby oil refineries. This seems plausible given that a possible leak was eventually located at Greenpoint Avenue and North Henry Street, then in the middle of Standard Oil's tank farm, now regarded as a likely culprit in the spill. 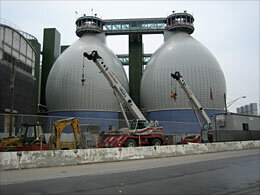 One of six pairs of eggs at the sewage treatment facility in Greenpoint. The things in the photo at left are called digester eggs. Through a process called anaerobic digestion they reduce the volume of sludge (what's left of sewage after debris and liquid are removed) by nearly half. The egg shape is a space-efficient and minimal maintenance European design. The green thing in between the eggs is an elevator, in case you want to see what's going on up there. 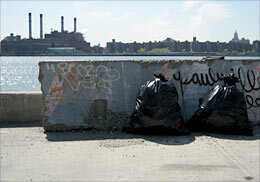 In the 1960s the oil refineries moved out of Greenpoint and the sewage treatment facility moved in. When the current upgrade is completed it will feature twelve of these eggs, to give an idea of its size. To this day it is a source of various pungent odors which, to your relief, current Internet technology prevents me from presenting here. The fact, however, is that the facility has cut down on the amount of raw sewage flowing into the East River and has brought some amount of government attention to the environmental situation in Greenpoint. 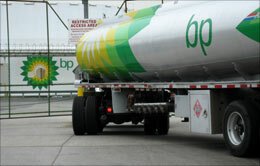 So it is a lesser evil than the refineries. Two bags were woefully inadequate. The end of Java Street (as well as nearby India Street) was once a pier from which ships would transport goods to and from, well, Java, among other places. 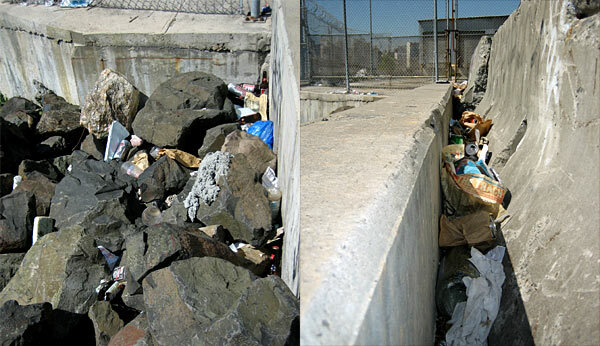 Now it just ends in a pile of rocks where one can enjoy a panoramic view of Manhattan (nearly 150 degrees, approximately from the Williamsburg to the Queensboro Bridge). I have spent a lot of time at this spot but the quantity of litter has always irked me, and one day I found myself wondering if people would be as quick to litter if the place was cleaner to begin with. So I decided to clean it up. I got some work gloves, a couple of garbage bags, and dug in. And dug, and dug. And there were quite a few more layers of bottles and styrofoam cups and magazines underneath and between the rocks than I had imagined. So two garbage bags weren't nearly enough, but I came back the next day, and the next, and then the rocks were nearly litter-free. The results of the experiment? Well, I don't know how quickly the litter accumulated before my cleanup but within a week the rocks were again thoroughly decorated. So I've learned not to mind the mess. 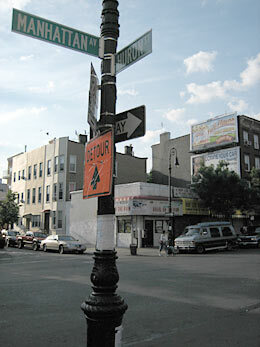 The extent of the panorama at the end of Java Street. The extent of the trash at the end of Java Street. The barren lifelessness of Kingsland Avenue. 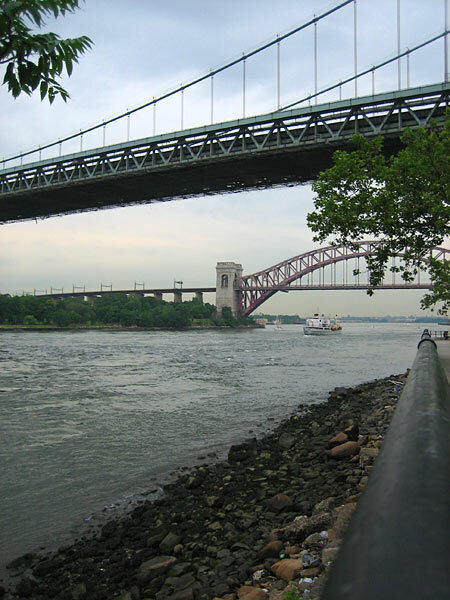 from Shore Boulevard in Astoria, Queens. 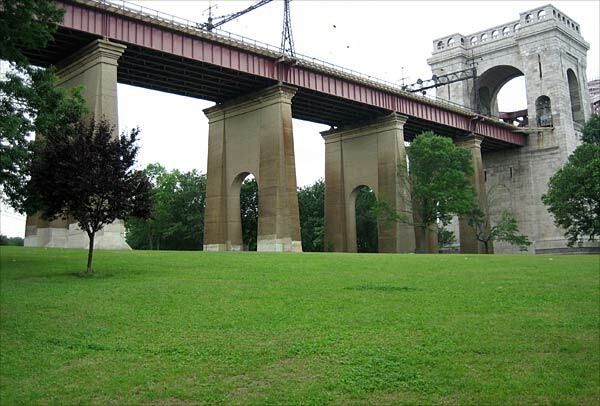 The Hell Gate Bridge crossing Astoria Park. 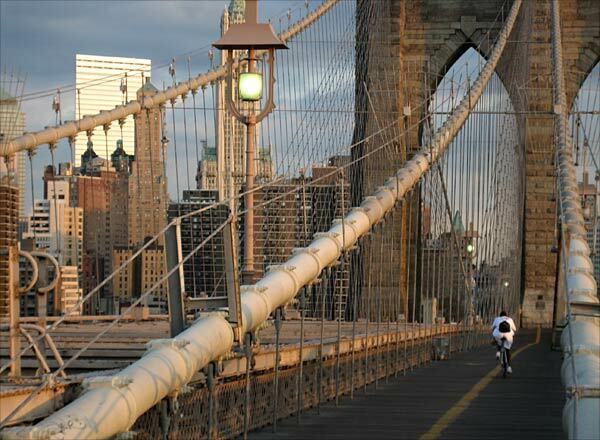 A lone bicycle rider and hundreds of cables on the Brooklyn Bridge at sunrise. 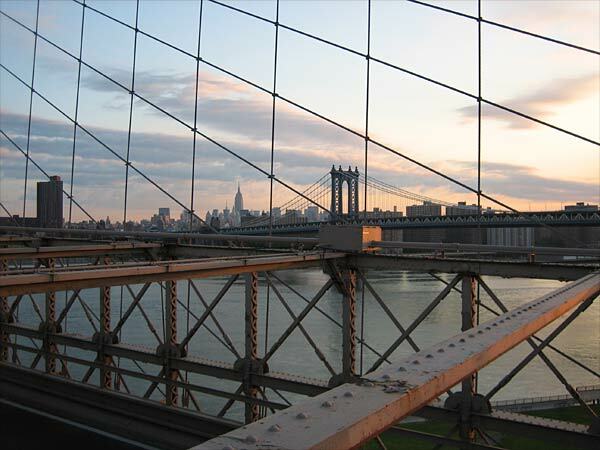 The Brooklyn (foreground) and Manhattan Bridges and the Empire State Building. 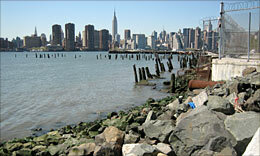 ^ "Greenpoint Greenpoint Uneasy Atop 17-Million-Gallon Oil Leak" New York Times 28 May 1979: B3. ^ "Greenpoint Rocked By Sewer Explosion" New York Times 6 Oct 1950: 17. ^ "Still Seek Brooklyn Gas Leak" New York Times 10 Oct 1950: 31.